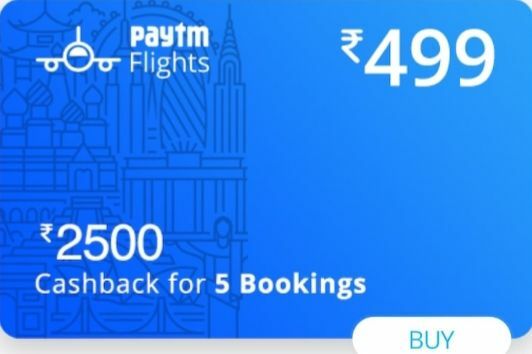 Get Rs.2500 and Rs.5000 cashback on Paytm flight offers.Buy travel card of Rs.499 & Rs.999 and book your flight tickets on Paym by these travel card and get cashback. Buy travelcard of Rs.499 and book your 5 flight tickets in 5 times. Minimum amount of each ticket is Rs.2000. 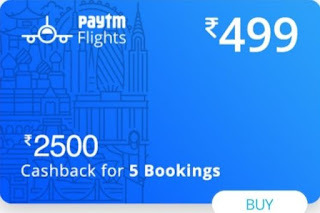 Whenever you book your flight ticket,each time you get flat Rs.500 as Paytm cashback. Buy travelcard of Rs.999 and book your 5 flight tickets in 5 times. Minimum amount of each ticket is Rs.10000. Whenever you book your flight ticket,each time you get flat Rs.1000 as Paytm cashback. These offers are valid only on Paytm website ( paytm.com /flights),Android & IOS Apps. Last date of these offers is 31st December,2018. If you cancel any booking ticket then this transaction is not eligible for cashback. Cancellation of this deal is not allowed. When you purchase this travelcard then you get a promocode.This promocode you need when you book your flight ticket to get cashback. To get the cashback,user needs to verify your mobile number on Paytm and should be KYC compliant. If you not complete yet Paytm KYC then you will not get wallet cashback according to new RBI' guidlines. How you can use it ? 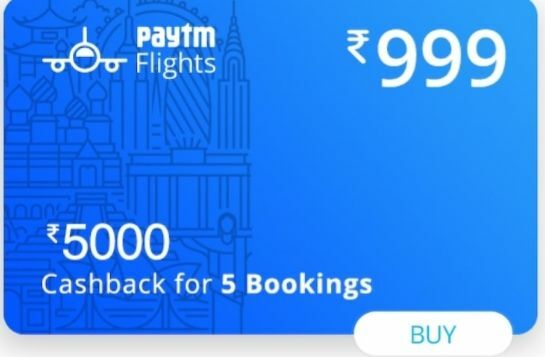 Visit the paytm.com/flights or click here from the app to avail the offer. Now select your flight tickets according to your plan of journey. Now enter your details,coupon code on "Have a promo code" section and click on "apply". Final words-I hope guys,you find out this is the best information for you.If you any query or doubts about above Paytm flight offers,please comment.This is my pleasure to solve your problems.